Kerala Chief Minister Pinarayi Vijayan Thursday lashed out at the BJP and the RSS over protests against the entry of two women into the Sabarimala temple, saying the violence unleashed by them will be dealt with strongly. Vijayan said the two women were not "airdropped" to Sabarimala but went as normal devotees and the other pilgrims did not protest. "Kanakadurga and Bindu were given protection after they sought security to visit the shrine. They were not airdropped. They visited shrine like normal devotees. None of the devotees protested," he told reporters here. The chief minister also said that conducting hartal over women's entry into the shrine was like calling hartal against the Supreme Court's order. Coming down heavily on the chief priest's action of closing the temple for purification ceremony, Vijayan said this was against the apex court's verdict. "Such things are to be decided by the Devaswom Board. The action was not only a violation of the Supreme Court's verdict but also against the rules of the board," Vijayan added. Widespread violence was witnessed in the state after two women of the traditionally barred age group visited the shrine early Wednesday. A total of 79 KSRTC buses were damaged in stone-pelting. Many media personnel, including women, were attacked and 31 policemen were injured. CPI(M) party offices were also attacked at many places. 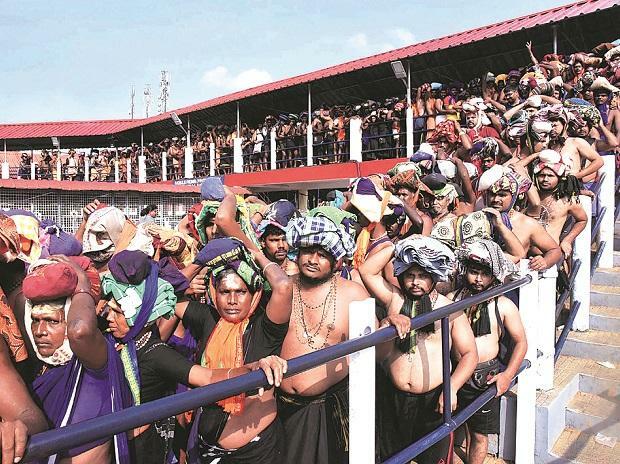 Right-wing parties and a section of devotees under the aegis of Sabarimala Karma Samiti have been protesting against the September 28 verdict of the apex court allowing women of all ages into the hill shrine of Lord Ayyappa. Following the entry of the two women, the Samiti, had called for a dawn-to-dusk hartal Thursday, which was being supported by the BJP.